Apparatus: Transmission line Trainer kit. Fig. Terminated lineâ€™s equivalent circuit. Open- and short-circuited transmission lines are widely used to construct resonant circuits as well as matching stubs. They correspond to the special cases for the load impedance: ZL =âˆž for an open-circuited line and ZL = 0 for a short-circuited one. Fig. shows these two cases. Fig. Open- and short-circuited line and Thevenin -equivalent circuit. Î“d =âˆ’eâˆ’2jÎ²d, and Î“GÎ“d =âˆ’Î“ Geâˆ’2jÎ²d=âˆ’Î“th. Z0, as shown in Fig. The quantities V0, I0 are the same as those obtained by connecting the actual line to the matched load, as was done in Eq. 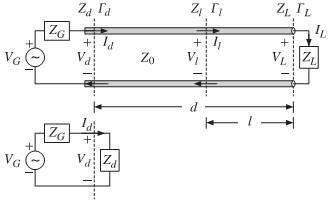 An alternative way of determining the quantities Vth and Z th is by replacing the length-d transmission line segment by its T-section equivalent circuit, as shown in Fig. where Za,Zb,Zc for a length-d segment are given by Eq. 1. Antenna trainer kit has four sections each of 25meter.Before doing any connection set generator voltage to 1 Volt/ 100 KHz. To measure accurate readings use DSO and keep it on measurement mode (Vpp& time). 2. Turn off kit supply and connect all sections to form continuous line of 100m. 3. To compromise source impedance, connect 18ohm impedance in series with source and transmission line. a) Total impedance of transmission line should be (50+18) ohms i.e.68 ohm. So terminate TL with impedance of this impedance for maximum power transfer. b) Measure voltage Vpp at loadconsidering it as starting point of measurement (i.e load terminal at 0 meter). Draw the waveform observed. a) Remove load of 68ohm from load terminal, measure voltage Vpp at this terminal as Voc at 0 meter; short this terminal and measure voltage Vpp at this terminal as Vsc at 0 meter. Draw the waveform observed. b) Now remove the connection between 3rd and 4th block of transmission line. Measure voltage Vpp at this terminal as Voc at 25 meter; short this terminal and measure voltage V pp at this terminal as Vsc at25 meter. Draw the waveform observed. 6. From observation table find maximum and minimum value of voltage measured and calculate VSWR, reflection coefficient using formulae given above. Value of reflection coefficient is minimum for matched termination as maximum power get dissipated into load whereas in open termination this value is maximum as all power reflects back to the source and in short termination value of reflection coefficient is same as open termination with negative sign since all power returns back with negative polarity. 1. To understand the concept of transmission line. 2. To understand the effect of loading on transmission line. 3. To understand the concept of VSWR, impedance matching and effect of short and open circuit on these parameters. What do you mean by the terms characteristics impedance and propagation constant of transmission lines. Define propagation constant, attenuation constant and phase constant of a transmission line. What is standing wave ratio (SWR) in a transmission line and how it is eliminated by stub matching? What are the different matching techniques? Describe some practical forms of feeder lines which are used to connect high power transmitter to an antenna. What is meant by voltage standing wave ratio? Discuss the importance of impedance matching in transmission lines. Explain the meaning of terms â€˜reflected wave â€˜ and â€˜standing wave ratioâ€™ with reference to a transmission line. Explain the form â€œcharacteristics impedance and propagation constant of a transmission line. Explain the concept of open , short and terminated load impedance. What are types of transmission lines? Why Reflection coefficient is used in feeder testing? When reflection occurs in a line? Give the input impedance of open and short circuited lines. State the relation between standing were ratio S and reflection co-efficient k.